For my project, I used with Love Window to the World Rubber Stamp. This cute image was super fun to color. With the fine brushes of Zig Markers, it was easy to color the details. I added lots of white glitter on the snow scene and the window with acetate keep everything inside the window. So, no mess, no fuss. For the final touches, I topped it with a die cut bow (from Swirl Wreath). And that's it! 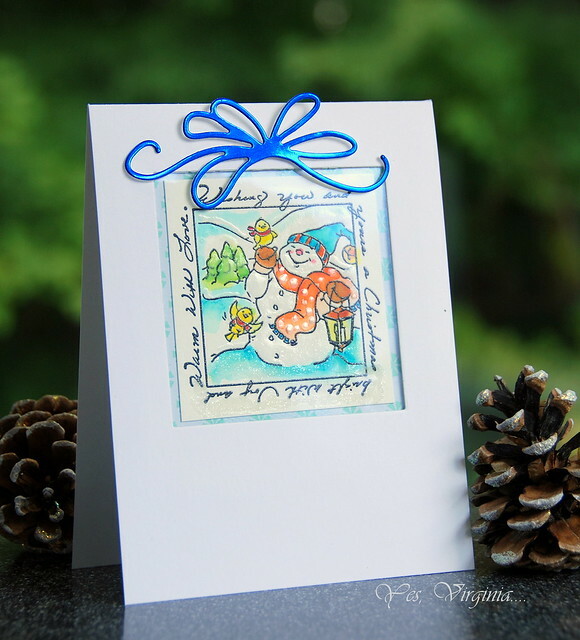 Love your happy card, Virginia - making this peek out of a window highlights it all the more! This is adorable, Virginia! The colors you chose are so warm and lovely, and the bow (!!!) took my heart! How did I ever miss this adorable stamp. Love the way the sentiment frames the image which you colored so beautifully. Also love that shiny bow, what a great addition. Smart of you to seal in the glitter. I have relatives that are still upset with me for sending glittery cards. Such a sweet image and I love how you colored everything with your Ziggies, Virginia! Loving your blue foil bow, too...so charming! A fabulous card Virginia, I love the fabulous image and the foil bow is stunning!! Gorgeous, Virginia! Love how you turned it into a gift!!! WOOT! super cute card, hope you have a fabulous weekend! So fun! Thanks for the heads up on the sale! I didn't know about! 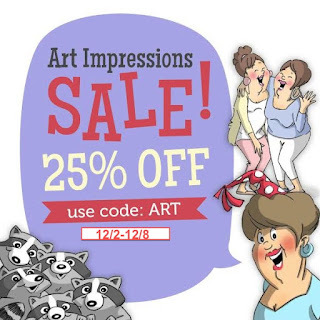 I'm starting to really love the fun Art Impressions sets! Might have to buy myself a christmas present, lol! Love how it's packaged up like a gift box! Gorgeous card as always. Love how you addded the foiled bow and made it a gift box. Clever!